Todd Jacobs a project scientist on the National Oceanic and Atmospheric Administration OAR Unmanned Aircraft Systems (UAS) Program and the Deputy Superintendent for Operations and Administration of the Channel Islands National Marine Sanctuary. He and his team have used UAS to survey wildlife in California and the Olympic Coast of Washington. They have also conducted experiments on monitoring debris on the Olympic Coast of Washington and in Hawaii. 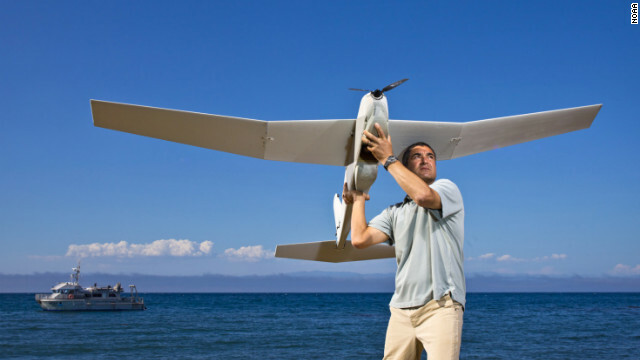 You’ve worked on NOAA’s UAS program since its inception, nearly 10 years ago. What drew you to the program? What’s been the most interesting part of its evolution over these last 10 years? What originally drew me to the UAS work was the potential for UAS to allow us to harness new and exciting technology that could potentially change the way we collect data in remote areas. The genesis of the NOAA UAS Program was a demonstration project in 2004 – 2005 that partnered the NASA Dryden Flight Research Center and General Atomics Aeronautical Systems, Inc. We were to fly a NOAA-centric payload on ALTAIR, a pre-production MQ-9 Predator B, with a unique wingset. That Predator allowed Altair to operate at higher altitudes than production Predator B UAS. Initially, my role in the project was to represent my division of NOAA and justify the requirements for certain components of the payload to be integrated as well as contributing to the planning of the mission. The most interesting and challenging parts of what has evolved to become the NOAA UAS Program has been the continuum from “concept” and demonstration, to performing successful missions on the Global Hawk and Puma AE platforms, some of which are on the verge of becoming regular, recurring, routine operations. The most personally satisfying accomplishment for me was the acquisition of our initial two AeroVironment Puma AE DDL UAS systems. This was the culmination of work that included the developing and vetting of requirements for, plus testing, analysis, and documentation of and justification for NOAA’s ship-based UAS operations. What I find really cool about what we are doing is that we are harnessing and repurposing technologies that were originally developed for military purposes and using them for environmental work. Unmanned aircraft have been used to help NOAA researchers around the world with oil spills, hurricane tracking and other tasks. Tell us a bit about your specific experiences. What have you found the most exciting? In partnership with NASA, NOAA is exploring Global Hawk’s role in hurricane and severe weather forecasting and global climate change research. My interest has been in using small UAS from ships to allow us to collect high-resolution imagery and telemetry in remote locations. NOAA has a fleet of about 10 research aircraft, 17 large oceanic research vessels that operate around the globe, and dozens of small research vessels and work boats operating closer to the continental shelf and along the coastlines. None of our ships are equipped to carry helicopters anymore. Many of the areas that we need to map, or are responsible for managing are in very remote and/or inhospitable locations for operating manned aircraft or small boats. Having the ability to launch and recover UAS from vessels at sea is like finding the Holy Grail for NOAA. For example, the traditional method of surveying marine mammals on a remote island would involve landing biologists through surf on a small boat. There are potential risks to sensitive wildlife, not to mention the risks to humans, plus there is always to possibility of introducing exotic species during the survey. By using UAS instead, the risk to personnel is eliminated, there is little to no chance that the animals will be disturbed, and there is zero possibility of the introduction of an exotic organism to a pristine place. In addition to the vessel-based seabird and marine mammal surveys, we have done some very interesting work with the Puma UAS. We’ve used it as a support tool in oil spill driilss, worked to identify tsunami marine debris, and are also looking at it for fisheries and marine protected area surveillance and enforcement. All of this work is very promising. My role in the NOAA UAS Program is to work with our research and monitoring staff to explore and define their requirements and match those requirements to existing UAS platforms and sensors if commercially available. We have a thorough process to develop, vet, evaluate, review, revise and approve our plans for UAS operations in NOAA. Not every mission concept should be flown with a UAS. We focus on the missions that can be done more safely, with higher resolution, are less disturbing to the animals, require persistency on target or are too remote or dangerous to get to otherwise. You have used both fixed-wing and multicopter UAS in your research? What are differences in uses of these models and the advantages of each? In my experience working with small UAS, the fixed-wing aircraft have longer range and persistence, but lower resolution cameras. They are best suited for surveillance, surveys of larger organisms, and detecting things like the presence or absence of marine debris or oil. Some small fixed-wing UAS such as the Puma AE can be launched and recovered at sea, even on relatively small boats. Small multicopter-type UAS can provide much higher resolution imagery, but generally suffer from relatively short battery life and flight duration compared to fixed-wing aircraft. We have not tested a multicopter system for recovery from a boat deck or at sea. I believe that UAS of this type have great promise for things like engineering inspections of offshore oilrigs. The difference would be that fixed-wing aircraft would be better for a population survey, while the multicopter could read flipper tags on specific marine mammals. As battery technology evolves, multicopter systems will be very interesting to NOAA for a variety of missions. Can you tell us about what you are currently researching? What do you expect to learn? This year, I am focused on a few things. Most immediately, I am the principal scientist on a NOAA/NASA to partnership to conduct science and operational mission flights over the remote Northwestern Hawaiian Islands archipelago (Papahānaumokuākea Marine National Monument, which is the largest marine protected area in the world. ), using Ikhana, a NASA MQ-9 Predator B, which will be configured as a USCG/CPB “Guardian”. The 2005 ALTAIR project was initially conceived with that project in mind. The area is vast and difficult to access and survey. I am very hopeful that this comes together. Also this year, in conjunction with academic and military partners, I am also working to conduct work with the ScanEagle system in both the Pacific and the Arctic. Lastly, I am working within NOAA to conduct our final Puma AE proof of concept missions in the Northwestern Hawaiian Islands and potentially in the Arctic with various partners. Working with the military and AeroVironment, we plan to perfect and document ship deck landing procedures for Puma AE, in NOAA. I hope that the procedures we approve are ultimately adopted by other agencies and industry. Advances in battery technology, computing power, miniaturization and communications/bandwidth will allow platforms and sensors to do more things with small UAS. The potential capabilities of UAS will be a game changer for the science community, once they can be routinely operated in the National Airspace System (NAS). One of the more difficult things for anyone to do is to imagine how to do what you have been doing in new ways. This is one way in which the NOAA UAS program adds value to our scientists. We regularly review the agency’s requirements for both aircraft and ship-based data acquisition and we compare the requirements to UAS capabilities. I believe that once the FAA publishes the small UAS rules, there will be an explosion of interest in using small UAS for routine mapping and biological census work.